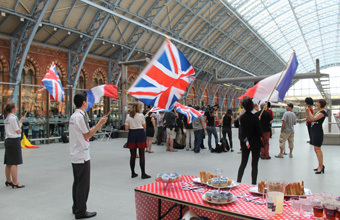 OLYMPIC athletes enjoyed a 'vintage British tea party' welcome at the Eurostar terminal in London's King's Cross St Pancras. Hostesses dressed in traditional British maid attire of black pinafores, frilly blouses and T-bar shoes served Earl Grey out of a Union Jack tea pot at the event organised by Mask Event Design and Production. The patriotic theme continued with floral and pink cake stands filled with afternoon treats displayed on a polka dot tablecloth and silver trays with jugs of iced tea. Suited and booted guardsmen completed the theme.